Afghanistan President Ashraf Ghani said in January that 45,000 security forces had been killed since he took office in September 2014. 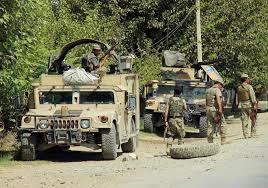 About 12 security forces have been killed in the last 48 hours in an ongoing fight in Afghanistan western province of Badghis, the defence ministry said on Monday. Afghan forces recorded devastating losses in during the last attack. Taliban group last week smashed through government lines near the city of Bala Murghab, seizing several checkpoints. "we regret to announce that during these operations, eight Afghan National Army and four police who fought with bravery and courage accepted martyrdom," the defence ministry said in a statement. 99 terrorists were killed and also about 10 soldiers and 24 police officers were wounded in the operation. Security forces helped Red Cross workers evacuate the bodies of Taliban fighters that had been left on battlefields. The spokesman for the Badghis governor, Jamshid Shahabi, told AFP that fighting continued near the district's main marketplace. Afghanistan and US-led aircraft were striking Taliban positions, he said. "They have suffered heavy casualties." Afghan defence ministry last week said it's forces had made a "tactical retreat" from a number of checkpoints in the district to "avoid civilian casualties". The head of the Badghis provincial council, Abdul Aziz had described the situation as "critical" and called for reinforcements. Taliban militant group said they had conducted a coordinated attack on a series of government checkpoints, killing 12 security forces. The Taliban group launched their assault ahead of a widely expected spring offensive. They declared a new fighting season as winter snows melt, and have in the past sought to gain control of district centres and target government facilities. The heat up began as Zalmay Khalilzad, the US envoy tasked with forging a peace deal with the Taliban, was in Afghanistan, where he spoke with national leaders and stakeholders. In the coming days Khalilzad is expected to go to Qatar, where Taliban and Afghan officials are due to meet. Taliban spokesman Zabihullah Mujahid told AFP the talks were set to begin on April 14.